Your guests understand and remember your message when they can watch, listen and learn. Many people fear standing in front of others to give a presentation but are completely comfortable and confident in a live online meeting environment using Present Video. 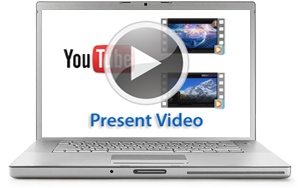 This handy meeting room tool allows you to play a YouTube video for your guests. This could be your video, or any public YouTube video. An advantage you have with a video is that you will make a positive first impression to your clients and prospects by showing them a carefully thought out presentation consisting of a PowerPoint, secure web pages, or something from your desktop. You will leverage your time because your video can be used in your ongoing, regular live meetings. In addition, you can choose to display a YouTube video in the main area of your meeting room so that guests can view the video even when you are not there (if you so choose). Administrators and compliance officers can easily add, remove and update the Present Video content of their client meeting rooms with company-approved presentation videos. View the Present Video tutorial.